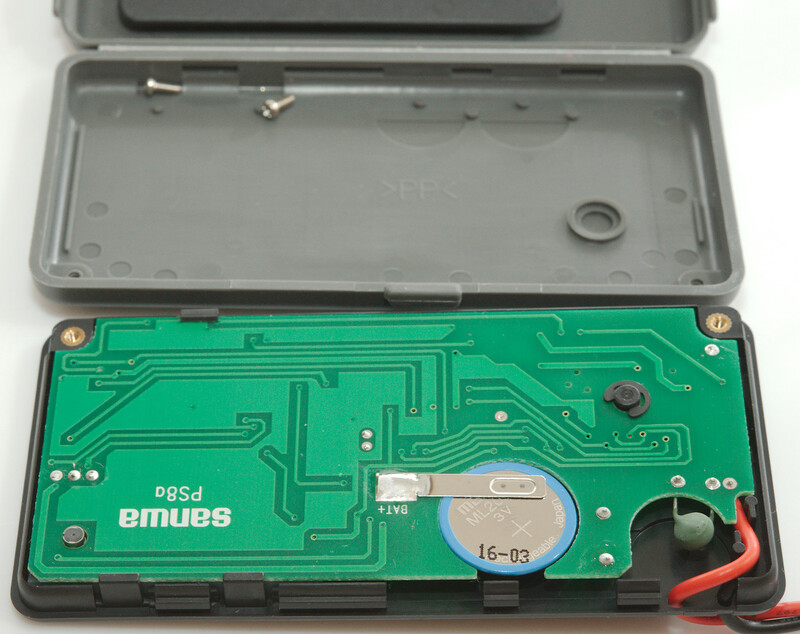 This is a small pocket DMM with voltage and ohms, but without current. 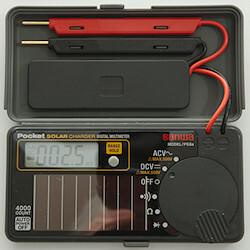 The meter is equipped with a recharge battery and a solar panel. The meter was in a transparent retail pack. On the back is a some explanation about using the meter. 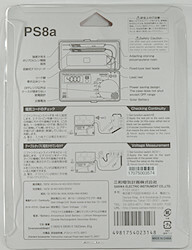 In the pack was the meter and a manual in Japanese and English. The probes are shaped a bit unusual to make for a very neat storage in the box. 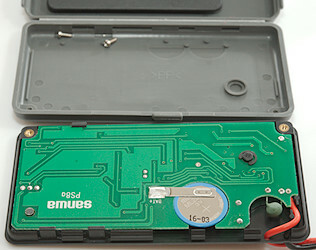 There is no soft strain relief where the leads come out of the meter, also note the lid, the hinge is plastic that folds. 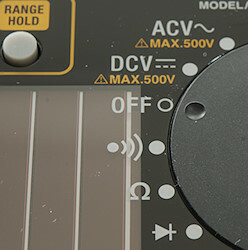 The range switch is easy to turn when using the tab on it, but it is necessary to hold the meter or it will rotate. The design of the switch wheel prevents the lid from being closed, except in the off position. 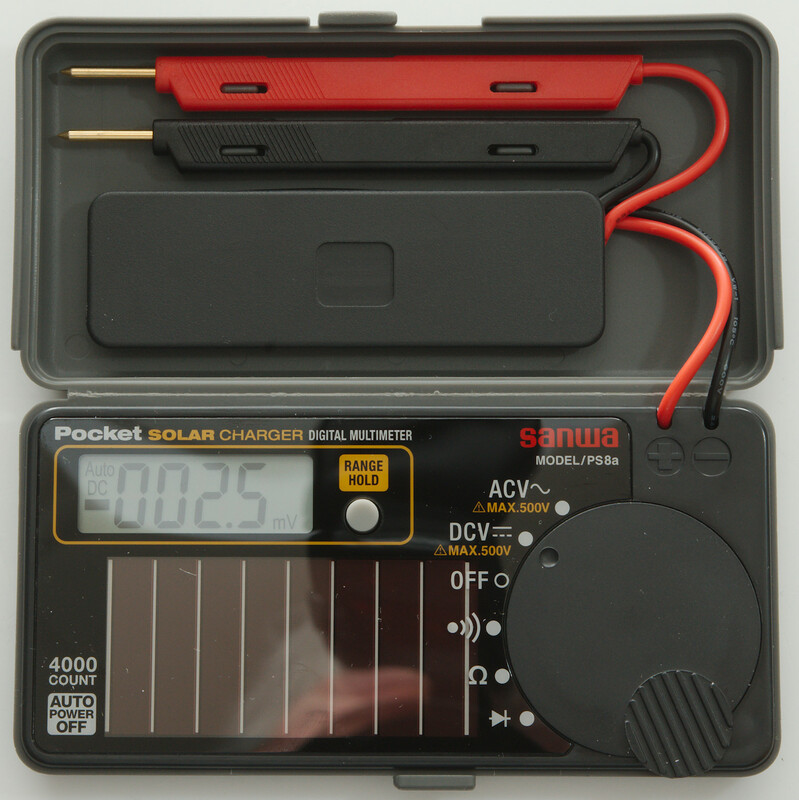 There is a fairly large solar panel on the front of the meter, this is used to recharge the battery. Window in cloudy conditions (5000 lux): 12 hours charge gives 3 hours usage. 10cm from 2x15W fluorescent lamp (10000 lux): 5 hours charge gives 5 hours usage. Window in bright sun (30000 lux): 5 hours charge gives 6 hours usage. 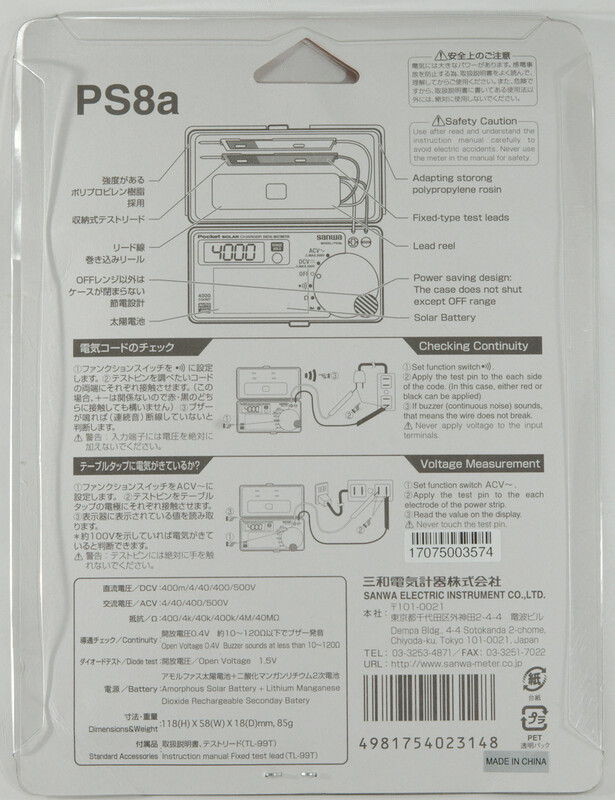 The meter do not have a CAT rating on it, but there is a warning on the back to only use it on low power circuits (Below 1kVA). 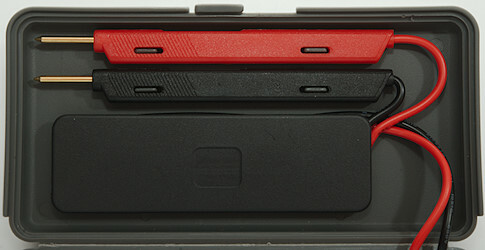 The above picture shows all the segments on the display, not all are used. Range hold: Will select manual ranging and change range, hold down to enable auto ranging again. 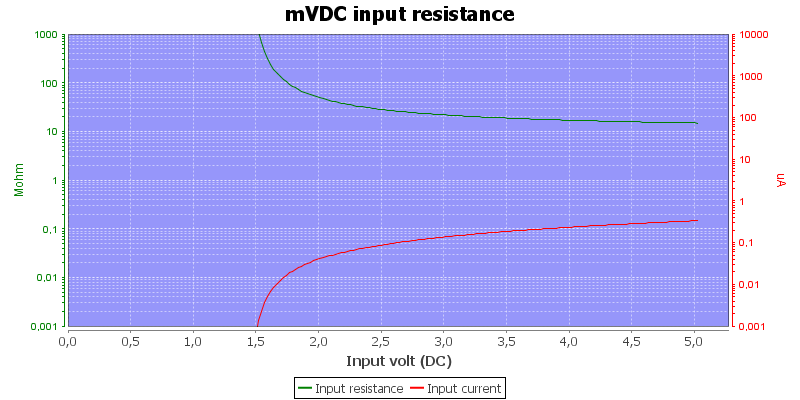 mV input impedance is high below 1.5V and drops to 10MOhm above. 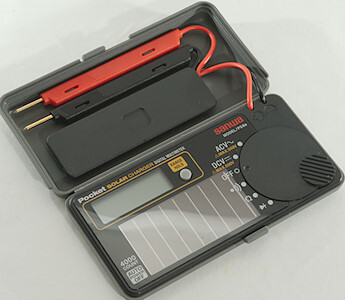 Meter starts to fade at 2V and fails below 1.6V, battery symbol shows at 2.3V. 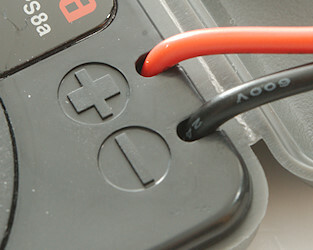 Readings will drift about 4 count from when battery symbols shows to the meter fails. Weight is 87.6g without accessories, but with batteries. Size is 118 x 54.8 x 18mm. Probe wire is a bit thin, the are 38cm long. 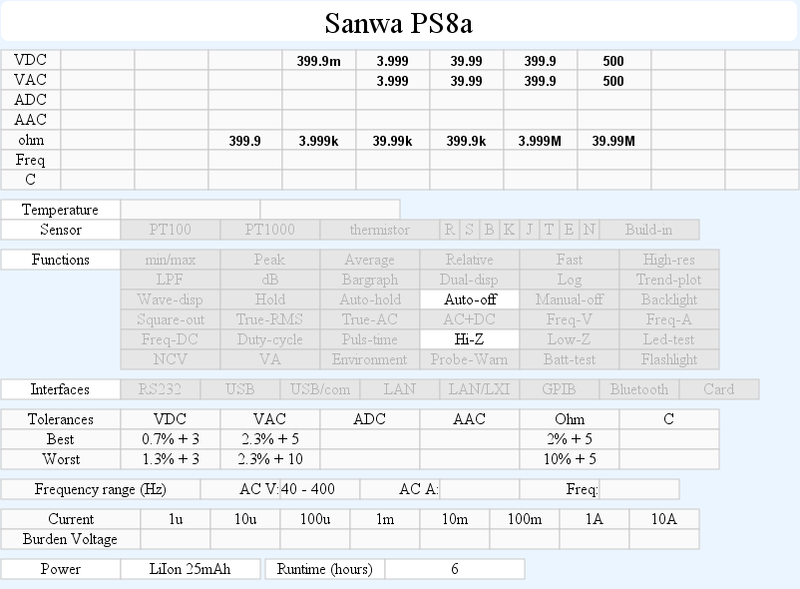 The meter cannot measure low AC volt when there is a large DC voltage. 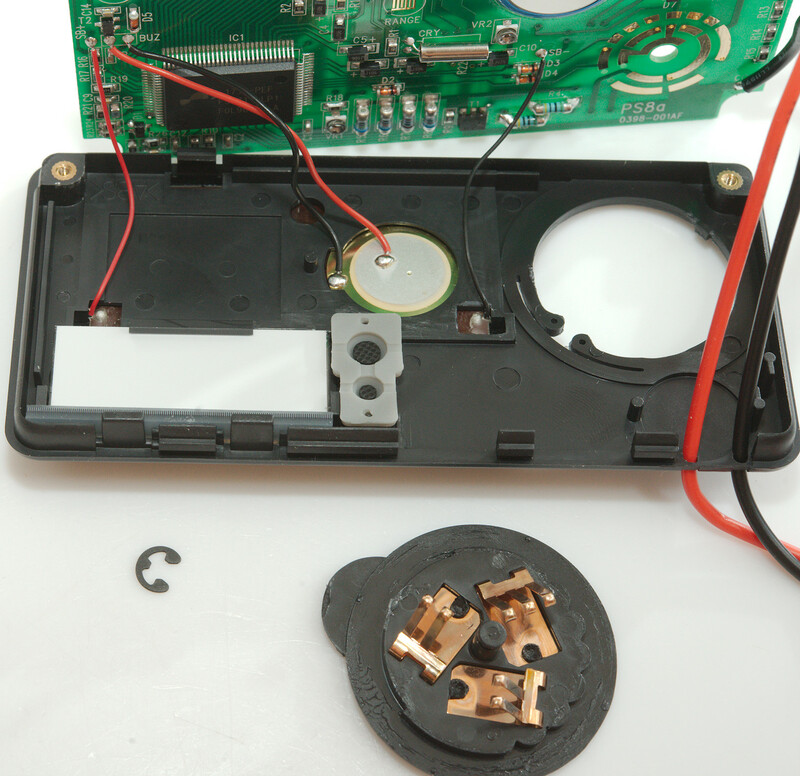 I only had to remove two screws to open the meter, if you have the spare part it is very easy to replace the box. 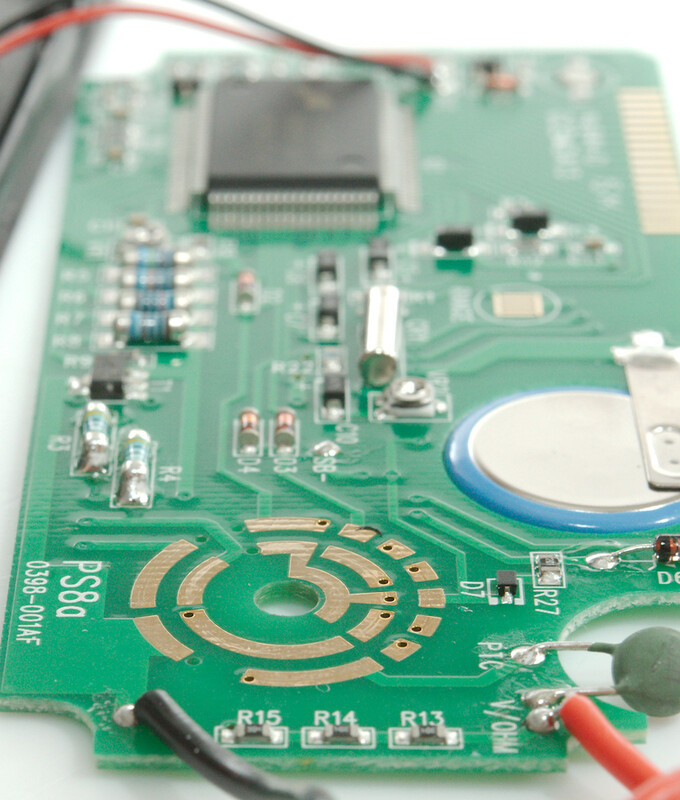 One circlip and I could remove the circuit board. At least partially, there was some wires resisting it. 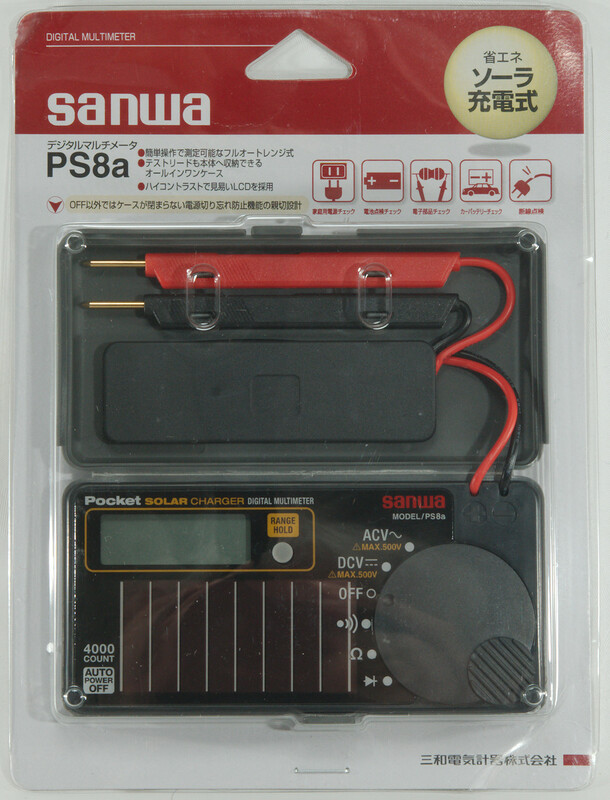 The front has the solar panel with two wires, a buzzer with two wires and a LCD display with a zebra stripe. 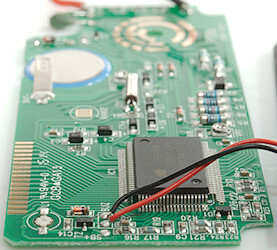 The probes goes through holes in the front and requires soldering to remove. 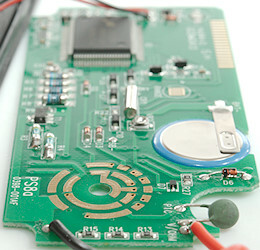 The voltage input uses two resistors (R3 & R4: 2x5Mohm). For the ohms and diode range there is a 3 resistor (R13, R14, R15: 3x300kOhm) input and a PTC output with a transistor (T1) clamp. 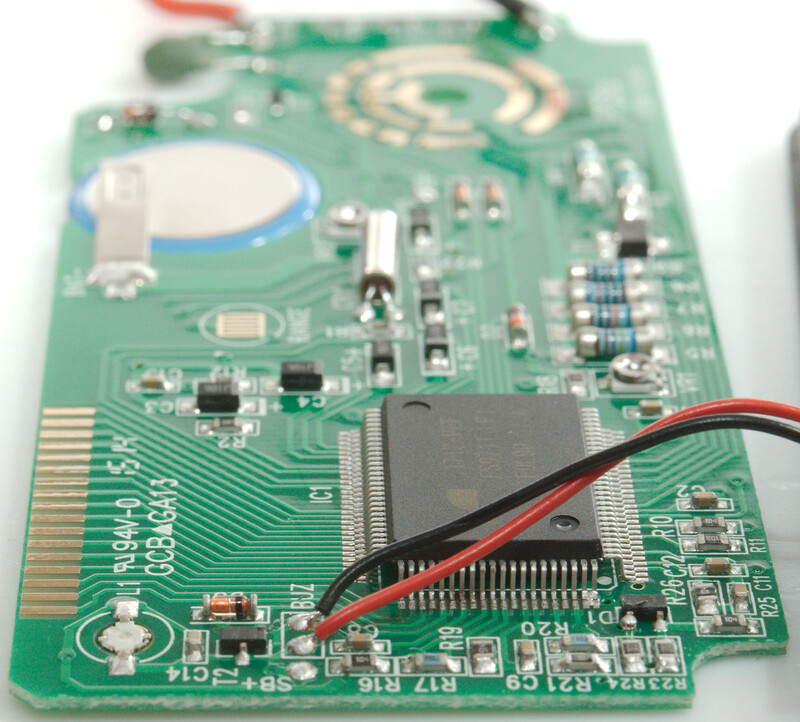 There is an inductor (L1) mounted inside the circuit board near the LCD pads. 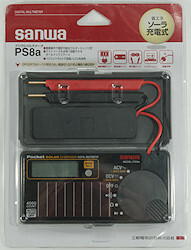 The multimeter is is a FS9711_LP1 (See datasheet for FS9721_LP1). There is not really anything on this side. This meter is not rated for mains use, the manual says to avoid transients, but the instruction sheet shows it used in a mains outlet. The meter is a bit low on ranges with only voltage and ohm/continuity/diode, but at least it has a manual range option. This meter looks like it is designed to keep in the pocket with occasionally use, the design do not look like it is made for heavy use. It needs to spend a day in the sun once in a while to stay charged.